#26 - I love Halloween! But that is because we usually average about 600 trick-or-treaters at our house every year. I know it sounds crazy but Halloween is a big deal in South Pasadena every year. Our streets are wide and flat and it's a very safe neighborhood. Personally, I think the whole town just gives out good candy. The night starts at about 5:30 with the really small kids and their parents (who are all adorable in their costumes) and finally ends at about 9:30 with the half-costumed high schoolers looking for candy. It's not the kind of night where you can relax. Unless you are sitting by the front door within reach of the doorknob. Because the door bell rings about every four minutes. 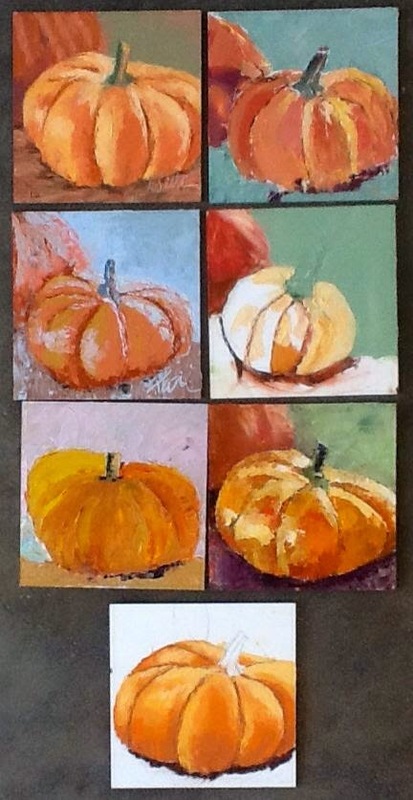 We painted pumpkins on the last day of my Ventura workshop. Although some of these aren't completed, check out these great paintings!